And where I say "talk" it could also be "chat" or "message" or… pick your communication verb. It's all about the "directory” of users. There's a war out there right now… and it's a war for the future of our communications between each other. It's a war for messaging… and it's also a war for voice and video. And it all comes back to… which communications application or service can provide the most comprehensive directory of users? If I want to call him and speak via voice or video, do I use Skype? Facebook Messenger? Google+ Hangouts? Facetime? Wire? Talko? Viber? Firefox Hello? insert WebRTC or OTT app du jour here>? Or just call him on his regular old phone line? By trial and error we start to figure out which of the people with whom we regularly communicate are available over which channels. Certain family members may be through Facebook… others through WhatsApp or Skype. 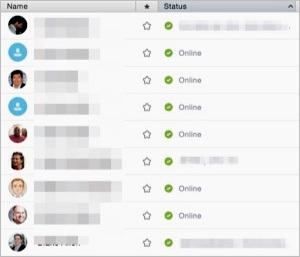 Work colleagues through Jabber or Yammer… except for some of them who primarily use Skype. These friends detest Facebook and so they are in Google+ ... and then there's that guy who thinks all of these new apps are junk and only wants to talk to you via SMS and phone. And every new app and service wants to fix it… and wants to be THE communications application/service that you use. But the point is that Skype amassed this huge directory — and now is the default way that many of us communicate via voice or video over the Internet. Certainly many of us, myself included, would like a better mechanism at this point… but we still use Skype because that's where the people are! The directory of users is there. They make it simple and easy… and it works because "everyone" has a Facebook account (or at least 1 billion people do). 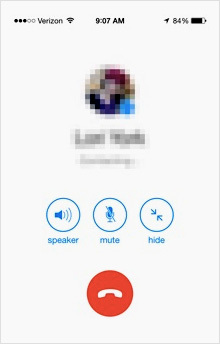 And WhatsApp has now moved into supporting voice calling. P.S. And Facebook actually has a third user directory in the form of Instagram (which now has 300 million users)… but we've not yet seen them do anything with real-time communications there. Google's focus today seems to be on Hangouts, which is available from the desktop and also from the iOS and Android mobile platforms. While Hangouts started out inside of Google+, Google has separated the application out. Back in December 2014 they rolled out a new version of Hangouts on Android that lets you add your phone number so that you are easier to find. They may at some point also integrate their Google Voice offering better into Hangouts. The point is that Apple can do all this and make it so simple because they have this massive user directory. Apple has a significant challenge, though, in that they only provide that user directory for Apple users - and seems to have no interest whatsoever in letting other platforms and operating systems access that directory. While we in North America don't tend to know their names, there are apps building huge user directories in Asia. Per the 2015 KPCB Internet Trends report from Mary Meeker, WeChat, based in China, now has over 549 million monthly active users worldwide. LINE, out of Japan and used in much of Asia, has over 205 million monthly active users. There are others such as KakaoTalk in Korea that have large directories. What if a user does NOT want to be found? What if a user does not want to be contacted? Perhaps not by a specific user (ex. a stalker or troll) or perhaps just not by anyone. Most people don't want to receive spam and unsolicited communication. We can argue whether this is an application issue or a directory issue, i.e. should this ability to not be found be part of the application or a feature of the directory, but the point remains - privacy concerns are a big issue that any directory must consider. Does WebRTC Save The Day? When I published an earlier version of this article in December 2014, Aswath Rao asserted that Firefox Hello doesn't have the directory dilemma because it provides a way to pass a URL out to anyone so that they can simply call you at that URL. I documented this myself in a post back on December 2. 2014. I can see his point, but I would argue that for Firefox Hello to be truly useful to me in my regular ongoing communications, I need some form of a "directory", either as a directory in the cloud maintained by Mozilla, or as a local address book in my Firefox browser that keeps track of those URLs. To the degree that Mozilla wants to let Firefox Hello users build up their contact list, I think they still have this issue of building the directory. Aswath and I engaged in a Twitter discussion where he pointed out that WebRTC addresses can be much more decentralized like email addresses have been. He argues that they can provide much greater richness and freedom than a static directory of users. He's right… BUT… we now come back to the "discovery" issue that directories also address. How do I find your WebRTC URL to call you at? Sure, you can email it or IM it to me ... and I can then store it in my address book or contact list. But somehow I have to get it first - and I have to know that it is the current and best address to use for you. I often use Facebook to send a private message to someone because it's easier than finding the right email address and sending them a message. Now, if I synced my contact lists across all my devices perhaps it would be easier… but I don't and so sometimes FB messaging is easiest. I can see the same kind of thing happening with WebRTC URLs. Back to the "Directory Dilemma"
How, then, in all this mess does a new startup like Wire or Talko or Firefox Hello or whoever-releases-their-WebRTC-app-today build up a significant enough directory of users so that the application is usable by large numbers of people? Some may opt to use the identity systems of one of the major vendors mentioned before - but now you are putting your user directory in the hands of some other entity and relying on them to be there. And… you are excluding people who may not use that system. Some apps/services may make it easy for you to "find your friends" through using your "social graph"… the connections you have on Facebook, Google, etc. Some apps use your phone number as an identifier, but they still have to build up their own directory of users. Simply "using the PSTN", as some startups have indicated they do, does not inherently create your application's directory. It can help users find each other and help bootstrap the directory creation process, but the applications still need to build their directories. I don't know the answer… but I see this as a fundamental challenge for any new entrant in the space. How do they gain the directory of users so that people will be able to communicate with others using this new service? THAT is what the team at Wire needs to answer… and Talko… and every other app. Unless, of course, they just want to be happy as a smaller, more niche player. But most of these apps and services want to be THE communication platform you use more than any other. Their success - and funding - is tied to that goal. Let me end with one thought… this "directory dilemma" is in fact tied to the larger challenge of "identity" on the Internet. Back in the pre-Internet days our "identity" for real-time communications was simple - our telephone number. We might have had several phone numbers, but they were "ours” (although technically leased/rented from the telcos) and they were/are globally unique and globally routable. BUT… when we've moved to IP-based real-time communications, first with instant-messaging / chat and then with voice and video, we've also moved into a realm of fractured identities and identifiers with, as noted above, many different companies vying to have us use their system so that their directory is the most complete and comprehensive. I do definitely worry about a future in which our identities and the user directories are controlled by large corporations. This, to me, seems like it could be a severe barrier to the "permissionless innovation” that has brought about the "Internet of opportunity" that we have today. I'd like to hope that we'll arrive at some form of distributed and decentralized identities and directories that can be federated together so that people can find each other. (Which is why I'm intrigued by what the Matrix.org folks and others are doing.) I do worry, though, that the financial incentives are there for the larger corporate players to fight each other for dominance… and leave us regular users of the Internet without a choice. Note: an earlier version of this article appeared on Disruptive Telephony. Given this, and given that no single directory is greater than the sum of all other directories. I would expect that the first two directories to merge would have a significant advantage over their peers. In short, I would expect consolidation in this space. Possibly the smaller players might find advantage in interoperability(leader-bashing), especially if it looks like a single dominant player might emerge(e.g. Facebook). Given all this, the most likely companies to engage in standards creation would be those with smallish directories. For myself, I keep telling people to use Jitsi because I love it. In my idealized world if I'm emailing someone at joe@example.com I should also be able to call them at sip:joe@example.com. I just want SIP, SRTP, and ZRTP. I don't trust any of these companies. Especially not Mirosoft, which has shown they cannot be trusted with Skype. On the standards side, I would like the W3C to expand the scope of VoiceXML so that it's more general purpose. I want a VoiceXML browser on my phone/VoIP-client that I can program to handle incoming calls. Some kind of voice-captcha to force those who call me to identify as human. Good comments… and yes that's a good way to think about the value of a directory. It will indeed be interesting to see what kind of consolidation takes place. On a larger level this is all tied in to the online "identity" issue and the question: who provides your "identity"? I, too, wish that SIP would take off in a larger way… but there are a number of challenges there. (Hmm… maybe that's another post!) And it still doesn't solve the "directory dilemma". How do I find your email address? How do I know it is the most current one? I am very much interested in feedback as I do intend to further revise this article in another version. In particular I'm pondering different potential solutions that are being suggested.